Have you ever suspected that your addictions are actually attempts to “numb out” from an underlying emotional pain? If so, then you already understand a great deal about the root causes of addiction and have a sense of what Dual Diagnosis is. 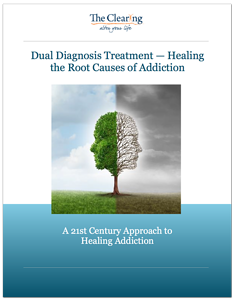 In this eBook we'll define Dual Diagnosis treatment and explain why for most individuals struggling with addiction, Healing Underlying Core Issues is paramount to breaking free. What is dual diagnosis treatment and do I need it? Is the 12 Steps approach effective? What dual diagnosis is and why it’s important? What is the connection between addiction and specific mental health issues (including depression, anxiety, bipolar disorder, and eating disorders)? What constitutes true dual diagnosis treatment and how to find it?